Summits: There are six summits in the chapter, namely: Water Crag (997 feet above sea level), Rough Crag (1049’), Seat How (1020’), Yoadcastle (1621’), Woodend Height (1597’) and White Pike (1450’). Date bagged: First visits: The first three — Water Crag, Rough Crag and Seat How — were bagged (in that order) on walk 91, 2/1/15. Looking up from Stainton farm. White Pike on left, Yoadcastle on right, the Knott (Stainton Pike) in the middle. The remainder, again bagged in the order listed above (WH – Y – WP), were reached on walk 101 on 16th September 2015. Second visit: Seat How and Rough Crag were bagged a second time on walk 133, 28th July 2017. 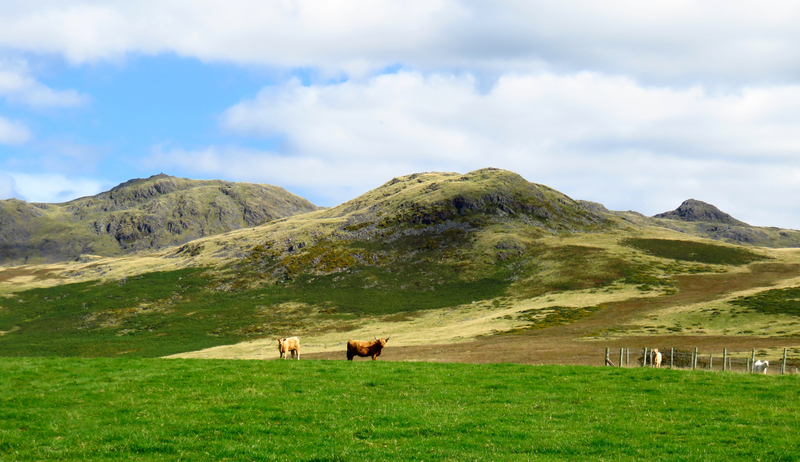 Route of ascent and descent: First visits: The first three: I came up from Eskdale, via the ‘peat road’ which rises behind the former farm of Brantrake — a fine climb. After doing the three summits, dropped down to Devoke Water then headed south for Hesk Fell. The second three: came up from Eskdale again, this time from Dalegarth, via Low and High Ground farms, then ascended Woodend Height from Devoke Water (reversing the descent suggested in the book). 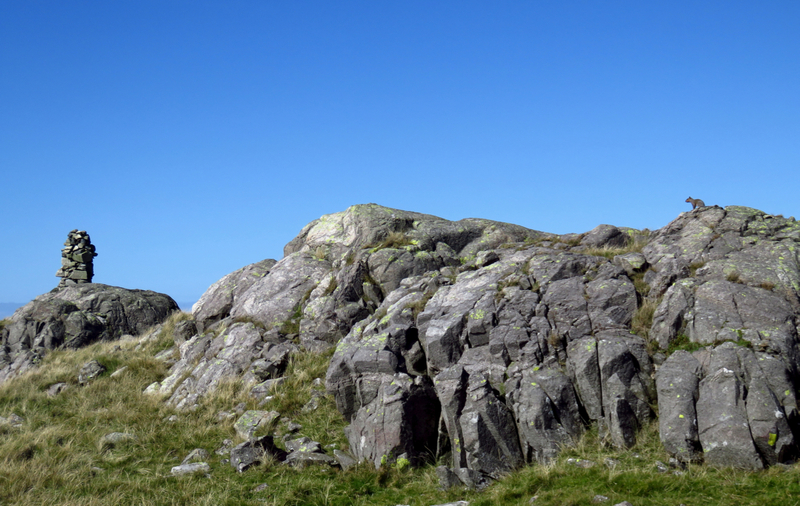 From White Pike I descended via the Knott (Stainton Pike chapter) then, via Muncaster Bridge, went to Ravenglass. Second visits: Came up Seat How from Woodend, went on to Rough Crag and then descended to Brantrake — which was nowhere near as good on descent in summer than it was on ascent in winter, thanks to bracken. 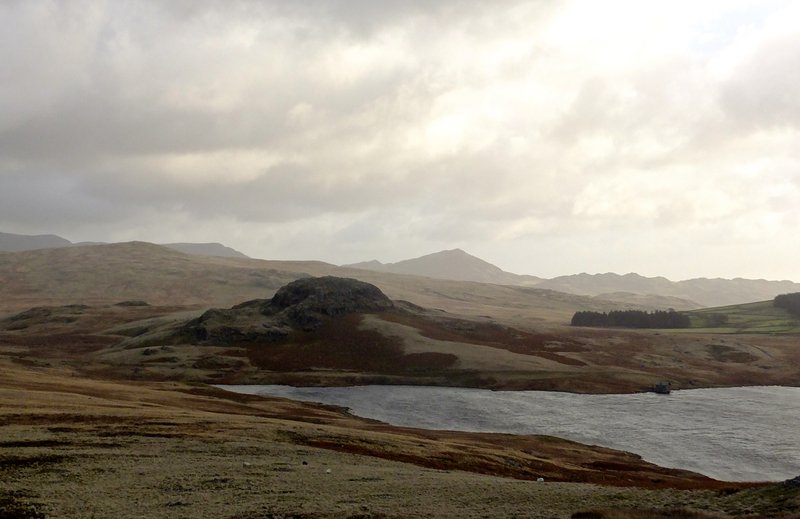 What Mr Wainwright says (from page 145 of volume 8): “The large tarn of Devoke Water, a popular resort of anglers and bathers, occupies a shallow basin in a surround of low fells, the tops of which yield the finest of all the views of the mountains circling the heads of Wasdale, Eskdale and the Duddon Valley…. What I say: This is a good area. 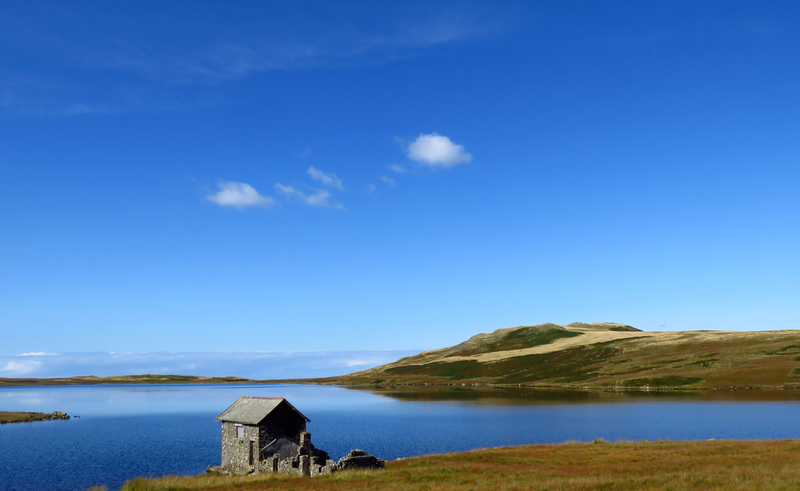 Three visits to Devoke Water (walk 40, walk 91 and walk 101) have convinced me that despite being a little bare, with not a single tree on its waterline (or indeed in sight from the waterline), it’s a fine spot, well worth time, particularly on a sunny day. Seat How is one of the cuter summits in the whole Wainwright canon, and in fact all six summits are distinctive. In Woodend Height and Yoadcastle the chapter also achieves the distinction of having the two Wainwright summits that are closest together, being barely 250 yards, or 0.14 miles, apart. 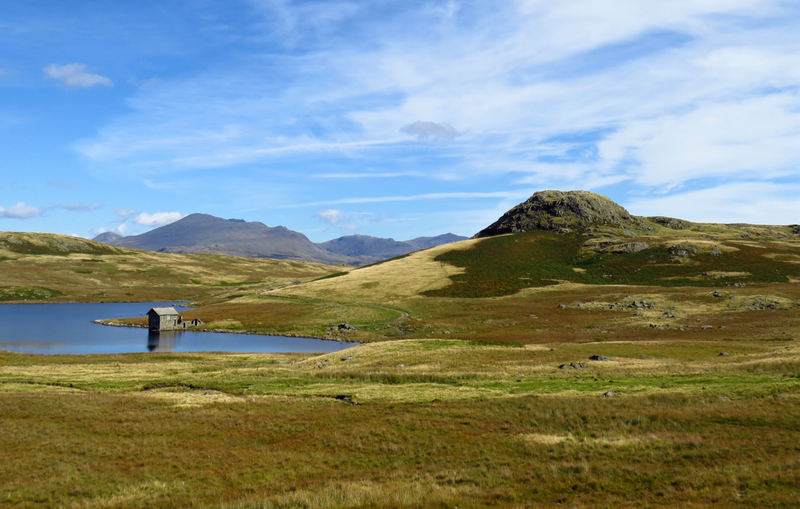 The views, both of the heart of the district (Scafell particularly), of the lonely Whit Fell/Barnscar region, and of Devoke Water itself, are very good. The only problem is access, particularly from the west. Walk 40 convinced me that I was never using the Barnscar – Dyke path again (ever). What I thought had been a good ascent up the peat road from Brantrake, Eskdale, in winter, became a bracken-clad nightmare in descent in late July. However, though I’ve yet to use it on ascent, the path up from Stainton farm to the Knott (part of the Stainton Pike chapter, but more logically included in this one) is fairly decent and is worth a try. Even then, though, you are quite a way from a railway station, and off the main bus routes. Bootle station is usable, but a long walk (a good 6 miles from White Pike), and Ravenglass station, while nearer, requires a walk along the busy A595 for at least part of the way.